In 1848 William Craft crafted a daring plan for he and his wife Ellen to escape from slavery. Ellen was very fair-skinned. He believed with some forged papers she could easily pass for white. So he decided to pose as her slave and attempt to board a train going north. However, in those days it was extremely rare that a woman would be traveling alone with a male slave as an attendant. Craft believed that the solution was to have his wife dress up as a white man. To formulate the disguise, Ellen Craft’s face was wrapped in bandages and she wore a pair of tinted glasses. Ellen Craft was also illiterate. So that she would not be forced to write anything, a cast was placed on her right wrist. 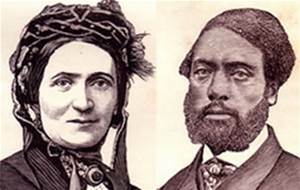 The couple was able to successful board a train to Philadelphia with Ellen disguised as a man. They became concerned because a good friend of their master had also boarded the train but they were not recognized as slaves, but the man did try repeatedly to start up a conversation. Ellen pretended to be deaf to avoid talking with him. At their last stop in Baltimore a railroad employee became suspicious and refused to allow William to board the train as it prepared to leave for Philadelphia unless he could provide proof that he belonged to Ellen. However the other passengers were sympathetic; believing that Ellen Craft was deaf, mute and ill and should not be allowed to travel without a slave to provide assistance. They were both allowed to board and complete their train ride to freedom.